The third day of the grand festival commenced with a welcoming parade. Acharya Swamishree presided upon a golden chariot pulled by sants and disciples from the Panchmahal region. All the members of the Shree Muktajeevan Pipe Band were donned with the traditional ceremonial turbans of Panchmahal. Lead by the Band, the parade proceeded from the temple to the stage of the assembly marquee. Throughout the parade, Acharya Swamishree gave darshan to all the onlookers and bestowed His divine grace to everyone. You have all come here, to this festival, in order to progress in your spiritual life in some manner. That will be achieved only if whilst sitting here, you pay the utmost of attention to all the different events that are taking place and are imbibing the beneficial teachings into your souls. And when you return to your homes after the festival, if you continue to recall all the divine memories you have amassed. When Jeevanpran Shree Muktajeevan Swamibapa first came to this region, He arrived in an open jeep, as an ordinary vehicle would not have been able to cross the rough terrain. During the journey through the dry, arid plains, there was a fierce sand storm. Fine sand started to blow onto everyone in the jeep. So the sants tied cloth over the back of the jeep. Still, fine dust seeped in and covered everyone. By the time Swamibapa reached Vaghjipur, the saffron colour of His clothing was completely hidden. Having travelled all day, Swamibapa’s jeep reached His loving disciples of Panchmahal at approximately 4.30pm. That auspicious day for the entire Panchmahal region was 31 March 1952, Samvat 2008 Chaitra Sud 4. As Swamibapa stepped out of the jeep, disciples sang devotional songs to welcome Him. The people of Panchmahal still sing that special song. 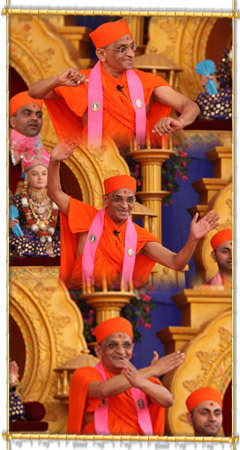 Swamibapa smiled and showed His divine love and grace over everyone. The sants removed the seat from the jeep and placed it onto the ground for Swamibapa to preside on; because at that time, the disciples of Panchmahal could not afford a single chair, bed or any other kind of furniture. Why am I telling you this story? Because, as stated in Vachanamrut Gadhada First Section Chapter 38, by recalling the divine deeds performed by the Lord, the Murti of God is remembered. Therefore, in order to keep the memory of the Lord’s vibrant in your mind, ensure that you remember the Lord’s divine deeds. The Lord says that in order to traverse the ocean of life, there exists one ship, and that is to remember the divine episodes performed by the Lord. At Shree Swaminarayan Gadi, the supreme Lord Shree Swaminarayan is performing divine deeds and providing unforgettable memories for all His loving disciples. Instill these into your minds and traverse the ocean of life. Then, at the end of your human existence, you will attain the supreme bliss of the Lord’s Murti. After Acharya Swamishree’s divine blessings, a large group of dignitaries of the region and representatives of social establishments of Panchmahal, came for Acharya Swamishree’s darshan and blessings, and to commend Him for His work for the reformation of Panchmahal. Some of these guests were not of the Hindu religion, and so they were very pleasantly surprised that Acharya Swamishree had allowed them to go onto a stage with Him and honoured them. On this occasion, a new scripture called ‘Panchmahal Thayo Nyal’ was inaugurated by Acharya Swamishree and senior sants. This scripture retells the history of Panchmahal and details how Jeevanpran Swamibapa mercifully transformed the entire region and improved the lives of countless thousands of suffering people. During the afternoon assembly, the recital of Shree Swaminarayan Gadi Granth was continued by Sadguru Shree Jitendriyapriyadasji Swami. Thereafter, disciples on whose behalf the 1300 recitals of Shree Abji Bapashree ni Vato had been performed, were given mementos of the occasion by Acharya Swamishree. Young disciples of Panchmahal, Maninagar and sants performed devotional dances to pease Lord Swaminarayanbapa and Acharya Swamishree. Many of the participants performed on stage for the first time. Traditional tribal dances of Panchmahal were also performed.